amended: if traders still fail to comply, then details of the claim and the ASA decision are published. Looking down the list, it is dominated by health products, including something I misread as psychic dentistry. Wonder products include a multi-tasking device claimed to help reduce HIV infection levels among other achievements, a supplement that can rebuild cartilage and a liquid chlorophyll that cleanses and deodorises the blood. Many of the sites claim proven health benefits for their products but fail to supply evidence of efficacy. It’s all a bit of a blast from the past. 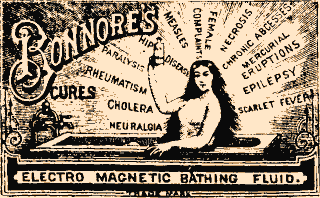 Advert for electromagnetic bathing fluid, claimed to cure a range of serious conditions. Public domain via Wikimedia Commons.